Jubilant crowds celebrated on Friday as Bangladesh and India swapped tiny islands of land, ending one of the world’s most intractable border disputes that has kept thousands in stateless limbo for nearly seven decades. As the clock struck one minute past midnight, thousands of people who have been living without schools, clinics or power for a generation erupted in cheers in celebration at their newfound citizenship. 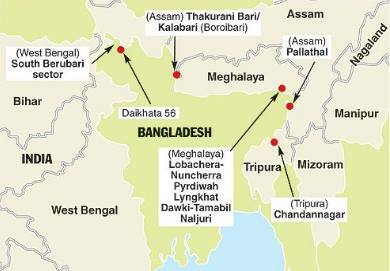 A total of 162 tiny enclaves — 111 in Bangladesh and 51 in India — were officially handed over to the countries surrounding them after Dhaka and New Delhi struck a border agreement in June. The land-swap means some 50,000 people who have been living without a state to call their own since 1947 will now officially become part of the countries that surround their homes. In Bangladesh, thousands of people defied monsoon rains to celebrate, staging patriotic marches and lighting 68 candles to mark the end of “68 years of endless pain and indignity”.